Chunky Stirrup Silver Earrings : LOVE2HAVE in the UK! A set of chunky silver earrings that are based on the links that feature in the chunky bracelet from the same sterling silver collection. 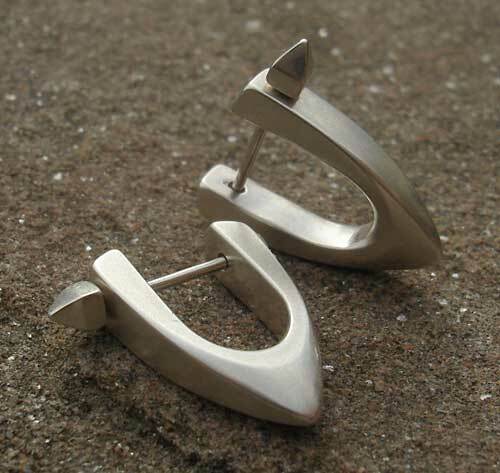 Both earrings have a stirrup type shape to them, each individually smoothed and tapered into a streamlined design. Each link measures 22mm in length and 4mm x 8mm in thickness and width. The earrings are completed with horizontal silver wires featuring pyramid style stud fasteners. The silver finish is a luscious, silky matt that subtly reflects the light and therefore avoiding a tacky feel of cheap over polished silver. Returns Policy: Due to hygiene reasons, this item is non-returnable unless faulty or not as described. Please see our terms and conditions.